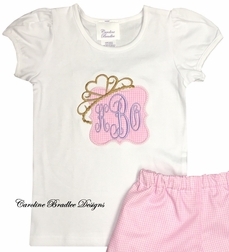 Here we take one of our cute white ruffle girl's shirts and applique it with a sweet pink gingham scalloped monogram frame topped off with a gold princess/queen's tiara crown! The pink gingham patch is monogrammed with your little one's 3 initials in lavender Fancy Script font. 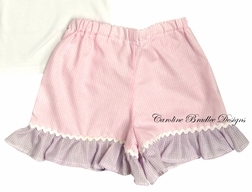 We pair the shirt with our pink gingham shorts with lavender gingham ruffles and white ric rac above the ruffles.